A regular breeding resident and migrant; occasionally reported during the winter months at scattered locations, principally in southern Minnesota. The Green-winged Teal was an uncommon species during the Minnesota Breeding Bird Atlas (MNBBA). A boreal-nesting species found throughout Alaska, Canada, and the northern United States, from northern California east through the Great Lakes and New England. The core of the Green-winged Teal’s breeding range is in northwestern Canada and Alaska. Within the region sampled by the federal Breeding Bird Survey (BBS), the species is most abundant in south-central Alberta, Saskatchewan, and northern North Dakota (Figure 1). A game species, the Green-winged Teal is assigned a Moderate Continental Priority by the North American Waterfowl Management Plan. Partners in Flight assigned it a Continental Concern Score of 8/20. A year-round resident in portions of western North America; elsewhere the Green-winged Teal is a medium-distance migrant that winters along the Pacific coast, in the southern United States, the Caribbean islands, and Mexico. A dabbler feeding primarily on aquatic vegetation, and grasses and sedges on mud flats and in shallow water; also consumes aquatic invertebrates and occasionally waste grains. Breeding distribution and relative abundance of the Green-winged Teal in North America based on the federal Breeding Bird Survey from 2011 to 2015 (Sauer et al. 2017). The Green-winged Teal has always been a common spring and fall migrant in Minnesota but has had a spotty nesting history. In the late 1800s, Hatch (1892) reported it was a frequent breeder in Hennepin County, and Tom Miller, a hunting guide at Heron Lake in Jackson County, reported he found a nest at the lake in 1888 (Roberts 1932). By the early 1900s, however, when Roberts wrote his two-volume book on the birds of Minnesota, there were no nesting records since Hatch’s and Miller’s accounts in the late 1800s. Nevertheless, pairs were observed during the summer months at a variety of widespread locations, ranging from Jackson County in the south, to Kittson County in the north, and east to Isanti County, leading Roberts to suspect that the bird might still be nesting in the state. When Green and Janssen wrote their account of the species in 1975, they described the Green-winged Teal as a summer resident throughout the state but one of Minnesota’s rarest breeding ducks. Nesting had been documented in 14 wide-ranging counties, including Marshall and Polk in the northwest, Nobles and Yellow Medicine in the southwest, Rice and Wabasha in the southeast, and Hennepin and Washington in east-central Minnesota. Several years later, Janssen (1987) noted that “scattered individuals or pairs can be found in almost any part of the state during the breeding season.” He identified 9 counties where nesting had been documented since 1970: Aitkin, Anoka, Beltrami, Big Stone, Clearwater, Lake, Roseau, Winona, and Wright. Eleven years later, Hertzel and Janssen (1998) added 3 more counties to the list: Crow Wing, Hennepin, and Marshall. The Minnesota Biological Survey has reported 78 breeding season locations for the Green-winged Teal since the late 1980s. Widely scattered throughout the state, the species was notably absent from east-central and southeastern Minnesota. The largest number of breeding season locations was reported from Clearwater County in north-central Minnesota (Minnesota Department of Natural Resources 2016). During the MNBBA, participants reported 154 Green-winged Teal records in 2.8% (133/4,738) of the surveyed atlas blocks and in 3.0% (70/2,337) of the priority blocks. Breeding was confirmed in only 9 of the surveyed blocks (Figures 2 and 3; Table 1). Observations were reported from 47 of Minnesota’s 87 counties (2 counties, Hennepin and Rice, were included because of blocks that straddled these counties), and breeding was confirmed in 5 counties (Anoka, Lac qui Parle, Mahnomen, Marshall, and St. Louis). The majority of records for this boreal-nesting species were in the Laurentian Mixed Forest and Tallgrass Aspen Parklands Provinces; it was still largely absent from southeastern Minnesota. As is the case for so many of Minnesota’s waterfowl, Agassiz National Wildlife Refuge, Thief Lake Wildlife Management Area, and the surrounding wetlands in Marshall County are extremely important for Green-winged Teal. There also were scattered reports, including 1 breeding record, from the greater Twin Cities metropolitan region. No longer among the rarest breeding ducks in Minnesota, the Green-winged Teal’s 133 atlas records were greater than those reported for seven other species: Bufflehead (27), Red-breasted Merganser (37), Lesser Scaup (49), Northern Pintail (55), American Wigeon (55), America Black Duck (73), and Canvasback (94). Although it is certainly more abundant today than in the late 1800s, the Green-winged Teal remains an uncommon nesting species in the state. In his comprehensive overview of the species, Johnson (1995) noted that there were no documented changes in the species’ distribution. In Ontario, however, the species may have nested only in the far northern regions of the province historically but today can be found throughout the province (Cadman et al. 2007). In Manitoba, the Green-winged Teal is a common species throughout much of the province but is particularly abundant in the wetlands in the southwestern region, just north of the border with Minnesota (Bird Studies Canada 2017). Many atlas reports from states in the Upper Midwest and Great Plains comment on its widely scattered breeding locations, including Wisconsin (Cutright et al. 2006), Michigan (Chartier et al. 2013), and South Dakota (Drilling et al. 2016). Breeding distribution of the Green-winged Teal in Minnesota based on the Breeding Bird Atlas (2009 – 2013). Summary statistics of observations by breeding status category for the Green-winged Teal in Minnesota based on all blocks (each 5 km x 5 km) surveyed during the Breeding Bird Atlas (2009-2013). Summary statistics for the Green-winged Teal observations by breeding status category for all blocks and priority blocks (each 5 km x 5 km) surveyed during the Minnesota Breeding Bird Atlas (2009-2013). The Green-winged Teal is a northern species, adapted primarily to the boreal forests and aspen parklands of the Canadian Prairie Provinces and the broad river deltas of Alaska. Although it nests in the Prairie Pothole Region as well, it reaches its highest nesting densities in Canada’s forests and open woodlands (Johnson 1995). Few studies have delineated specific habitat requirements during the breeding season. The birds seem to prefer seasonal and semipermanent wetlands, although they make use also of dugouts and stock ponds. Breeding wetlands usually have a high percentage of emergent cover and have shallow areas measuring less than 1 meter in depth (Figure 4; Baldassarre 2014). Typical breeding habitat of the Green-winged Teal in Minnesota (© Lee A Pfannmuller). Population numbers for the Green-winged Teal are estimated by the Waterfowl Breeding and Habitat Survey, a coordinated effort conducted by the U.S. Fish and Wildlife Service and the Canadian Wildlife Service. The survey is conducted in two areas: the Prairie Pothole Region of the United States and Canada (known as the Traditional Survey Area), and the eastern Canadian provinces and the state of Maine (known as the Eastern Survey Area). Although Minnesota is not included in either area, the Traditional Survey Area does cover those areas in Alaska and Canada where Green-winged Teal breeding densities are highest. Survey work conducted in 2015 generated a population estimate of 4.08 million birds in the Traditional Survey Area, more than double the 1.9 million population goal established for the area by the 2004 North American Waterfowl Management Plan. That same year, 2015, 221,000 birds were found in the Eastern Survey Area, resulting in a continental total of approximately 4.3 million birds (Zimpfer et al. 2015). Approximately 20% of the overall population occurs in the United States and 80% in Canada. 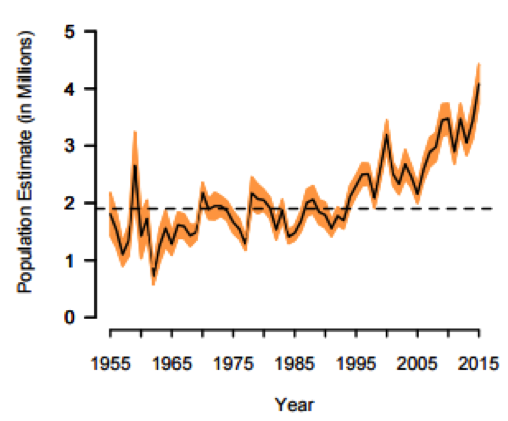 From a low in 1962 of only 722,000 Green-winged Teal, populations have grown steadily ever since (Figure 5). Baldassarre (2014) speculates that teal have prospered because, unlike so many waterfowl species, they depend on habitats in the boreal region of Canada rather than the Prairie Pothole Region, which has experienced extensive habitat loss and degradation. The bird’s well-concealed nests also may contribute to higher reproductive success. 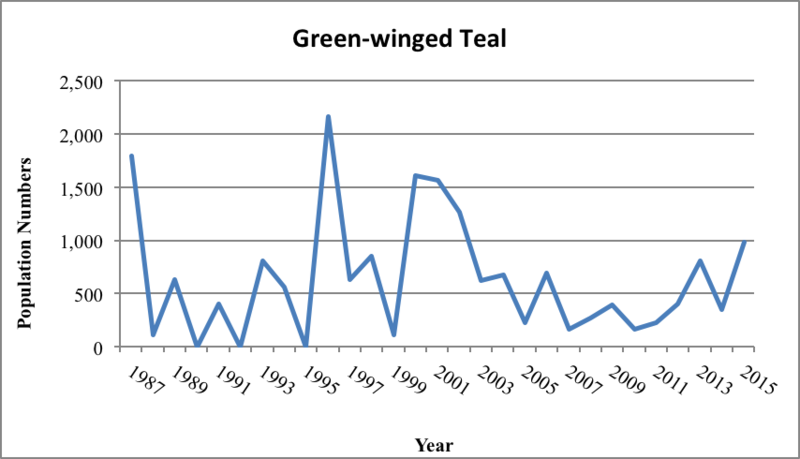 In Minnesota Green-winged Teal numbers have fluctuated widely since the mid-1980s (Figure 6). The average number of birds observed during the annual Minnesota Waterfowl Survey in 2015 was 641 birds, a mere fraction of the total population. Wide fluctuations on the edge of the species’ range, outside of its prime breeding habitat, are to be expected. Green-winged Teal comprise less than 1 percent of all breeding ducks reported during the Minnesota survey (Cordts 2015). Population estimates for the Green-winged Teal in the Traditional Survey Area, 1955–2015 (Zimpfer et al. 2015; dashed line is the NAWMP population goal). Green-winged Teal numbers reported during the Minnesota Waterfowl Survey, 1987–2015 (data not corrected for visibility; taken from data presented in Cordts 2015). With its increasing population and its dependence on boreal habitats outside of the Prairie Pothole Region, the Green-winged Teal has been assigned a Moderate Continental Priority by the North American Waterfowl Management Plan (2004). It is not recognized as a priority by any other state or federal conservation organization and is assigned a moderately low Continental Concern Score of 8/20 by Partners in Flight (2017). A popular game bird among waterfowl hunters, in the fall of 2015, Green-winged Teal comprised nearly 12% of the total duck harvest in the United States (1.29 million Green-winged Teal harvested). The total harvest was second only to the Mallard (3.43 million harvested in 2015). The 2015 harvest of Green-winged Teal in Minnesota comprised only 3% (41,199 birds) of the total U.S. harvest (Raftovich et al. 2016). Forty-one percent of the U.S. harvest occurred within the Mississippi Flyway. Given the healthy status of its population, little conservation attention has been focused on the Green-winged Teal. Specific management actions are lacking. Because it largely nests north of the prairie potholes of the United States and the prairie parklands of Canada, warming temperatures may impact this waterfowl species to a lesser extent than those that depend on prairie wetlands. “The State of the Birds 2010 Report on Climate Change” assessed the species’ vulnerability to climate change as low (North American Bird Conservation Initiative 2010).